Precise cuts and easy to use are the features of a rotary paper cutter. Have you ever used a guillotine cutter? Sometimes the papers can get caught in the blade and your cut is ruined. The way to avoid this is to consider a 36” rotary paper cutter. 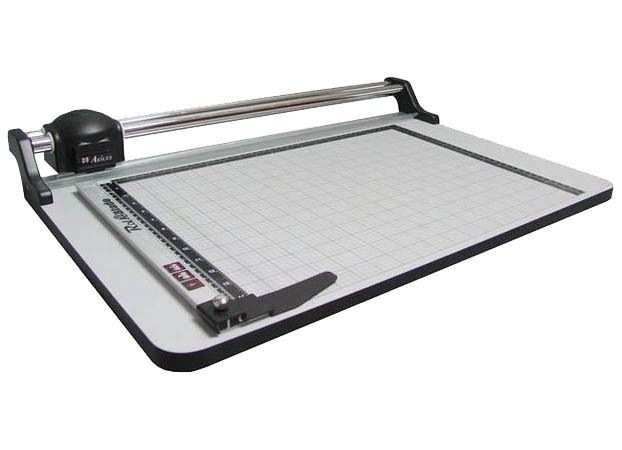 The Akiles RollBlade High Precision 36” Rotary Trimmer is an excellent paper cutter. It comes in two sizes, you can get an 18” table or the higher 36” in trimming length. The RollBlade High Precision 36” Rotary Trimmer uses a rotary blade that slides along an alignment guide to cut up to 15 sheets of paper simultaneously. The blade is encased in an ergonomic handle making it safer than a guillotine cutter because your hand or fingers are not exposed to the blade at all. The most important feature is the accurate cut a rotary paper cutter rovides. Unlike a guillotine cutter which slams down on stack of papers, the rotary blade runs a guided path that is straight and accurate. However, with that added stability comes lower capacity. The Akiles 36” rotary trimmer only takes 15 sheets, which is a lot less than a high-capacity guillotine-style paper cutter. But, the amount of time lost on stacking sheets is usually made up for with increased accuracy. The RollBlade currently sells for $345.00 on our website. For more information on the Akiles RollBlade High Precision 36” Rotary Trimmer. 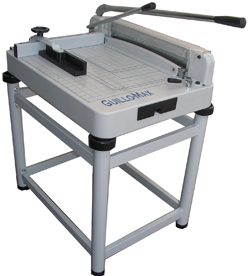 Need a Heavy Duty Guillotine Paper Cutter?